(A memorial service is supposed to be a serious occasion. And, of course, it is. However, in re­membering Trish’s life, it is impossible for me to omit her own quips. I hope that no one will be of­fended by my inclusion of these quips, and instead look at them as a reminder of her personality). 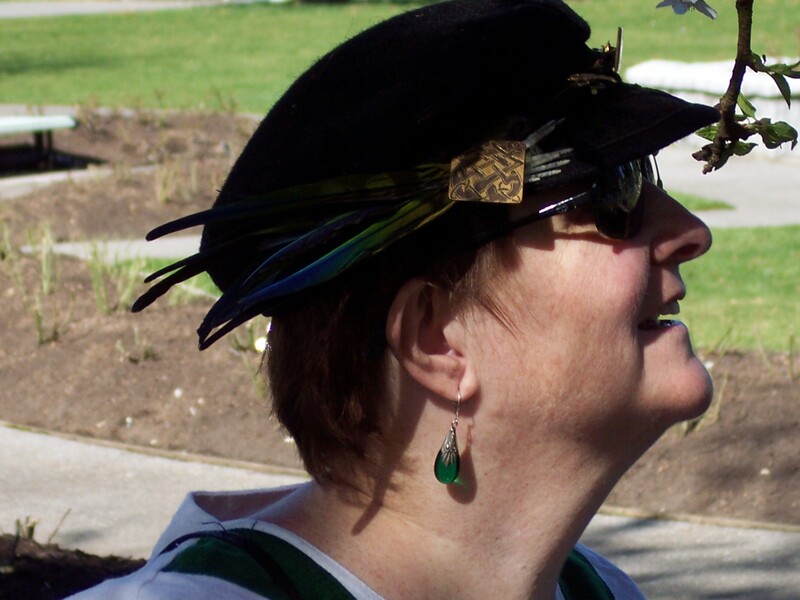 Patricia Louise McKinnon Williams was known by many names through her life, including Louie, Pat, and, in medieval recreationist circles, Morag Nic Fhingon. But she preferred to be known through most of her busy life as Trish. The last name she was less careful about, since nobody except strangers ever used it – and even most of them were calling her Trish after the first ten minutes. Trish was the youngest of the six children of Francis and Doris McKinnon of Cloverdale in Surrey. The age gap between them was so wide that the eldest had left home before she was old enough for school. It was only in middle age that she got to know most of her sib­lings, although she was always close to her sister Marion Crook. She attended the Cloverdale Catholic School and the Convent of the Sacred Heart, experiences that made her what she called a “recovering Catholic,” meaning one who no longer considered herself Catholic, but would fulminate against the misbehaviour of priests or the pope’s pro­clamations. Later, she attended school in Switzerland, where she ob­tained a knowledge of French that she later claimed was just good enough for her to read Asterix and Obelix books in the original. Returning home, Trish studied drama at Douglas College, then trans­ferred to Simon Fraser University. At the drop-in center, she met David “Corky” Williams, whom she married in 1977. A year later, Corky died of an epileptic seizure. A month after he died, Trish attended an SFU Medieval Club meeting, where we met and started dating. Afterwards, she would inevitably tell people that she had picked me up in a bar. Her mother tried to encourage her to find a law­yer or doctor to marry, but within months it was too late – we had already decided to marry. Delaying only until Trish found work in the SFU Accounts Payable Department, we married on May 17, 1980. We honeymooned briefly at my parent’s cabin at Whistler, driving there in a car loaned by her brother Ron, and the journey was much delayed by us pulling over every five or ten miles to open another wedding present. In our early life together, much of Trish’s interest was in various medieval groups and science fiction conventions, where we became friends with a number of writers. However, Trish – who was always proud of her charter Greenpeace membership card – soon found her political conscience awakening. Together, we served several years on the executive committee of the Burnaby North NDP, and for a nearly a dec­ade Trish was active in her union local, serving as Treasurer for several years, and for a month as Acting President. Later, Trish was to become involved in countless other groups: The Coquitlam Needleart Guild, The New Westminster Historical Society, the Pacific Rose Society, and, of course, her anonymous Monday night stitchery group are only the ones that come immediately to mind. She also became known in local exotic bird circles, as we quickly established a reputation for people who could take on Nanday conures, one of the noisiest and most demanding of parrot species. Eventually, our living room housed four: Ningabuble, his mate Sophy, their sons Rambunctious and Jabberwock and, later – after Jabberwock died – a rescue bird called Beaudin. Just about the time we were thinking of having children, our lives changed drastically when a routine gall bladder operation in 1995 resulted in Trish spending most of the summer going in and out of hospital. She continued getting sicker, and, in the next fifteen years, was in hospital at least twenty times. In 2000, she had to quit to work. However, it took another three years before she was diagnosed and obtained her pen­sion: She had carcinoid syndrome, a rare cancer-like condition untreatable by chemotherapy or radiation. In the last five years, her healthy and activities declined steadily. Even so, she managed to assist her sister Margaret Pedersen with the care of their widowed mother, and (when travel became impossible), to be­come an avid collector of Northwest Coast art. Her medical support team, all of whom inevitably became personal friends, remember her for her determination and cheerfulness as her condition left her prematurely aged. By 2010, Trish had survived so many illnesses and operations that we assumed she had years left to come. But she caught pneumonia at New Years, and five courses of antibiotics were not enough to cure it. In June, she spent three weeks in the hospital, and returned home on oxy­gen for a week. Her nephew David Crook and his family visited her twice at home, the first time worrying about her condition, and the second time reassured that she would pull through. But two days later, her condition worsened, and I took her to hospital in the early hours of the morning. She died at 2:55PM, surrounded by me and her sisters Margaret and Marion, and her brother Ron. My sense of the absurd must be one of my dominant traits. How else to explain why, when entering a funeral home to arrange the cremation of my life partner, it arose like a gag reflex – and was almost as hard to suppress? I admit that I was put off from the start by the air of unctuous, decayed conservatism with which the place was decorated. Neither the wallpaper nor the carpet, I am sure, was really red velvet, but both seemed designed to make you think they were. The impression I had was a striving after grandeur that I had sometimes seen in classic theater palaces, or in some hotels that are trying to convince tourists that they are glamorous, but cannot hide the fact that they have seen better days. Nor did it help that the meeting room was decorated with prints of cute children looking coy in Edwardian costumes. Norman Rockwell would have been a major advance in taste. Some, I suppose, might have found the décor comforting – assuming they were over eighty and never had much taste to start with. I found it a mockery of my purpose, and would have preferred a starkly minimalist modern décor that, although soulless, would at least be unobtrusive. Still, I had a reason for being there, so I did my best to ignore the furnishings. It wasn’t easy. My eyes kept sliding to the prints or other details so that I could control my annoyance as the funeral home representative half-heartedly tried to nickel and dime me to death. Only, it wasn’t nickel and dimes she was after, of course – it was two hundred here, or five hundred there. Somehow, though, we ground on through the process. All went well until I thought to ask about the home’s reception facilities. First, the representative showed me the non-denominational chapel. To me, “non-denominational” suggested a space that was designed to be spiritual without being specific to any religion. But, to the funeral home, the term meant “generic Christian.” Not only was it filled with the sort of narrow, stiff pews that require your body to do penance while the service works on your soul, but one wall had tiles in the shape of crosses. “How lovely for your Hindu and Muslim customers,” I wanted to say, but with a surprising surge of will, I managed to refrain. Instead, I asked about any alternatives. Thinking that I must have misheard her, I asked if she could show me a picture. She showed me a room with small round cafe tables with red checkered table cloths. Sure enough, one wall was a sliding garage door of corrugated aluminum. With an even greater super-human will, I managed not to succumb to a fit of giggling. I couldn’t wait to tell Trish about what I had just seen. Then I remembered that I wouldn’t be there if not for Trish. And somehow, that was the most existentially absurd moment of all: me wanting to tell her about absurdities that I never would have encountered if she were still alive.